[Updated] A 63-year-old man was arrested for “suspicion of driving whilst impaired” tonight [Jan 19] after his car went over an embankment in Paget, according to police. A police spokesperson said, “Police responded to a report of an incident that took place on South Road in Paget 100 yards west of the entrance to Elbow Beach at 7:42pm today [Saturday]. “It appears that a male driver of the car lost control of his vehicle resulting in the car going down an embankment by Coral Beach. “The driver and passenger were assisted out of the car by a member of the public and the driver, a 63 year old male was arrested for suspicion of driving whilst impaired. 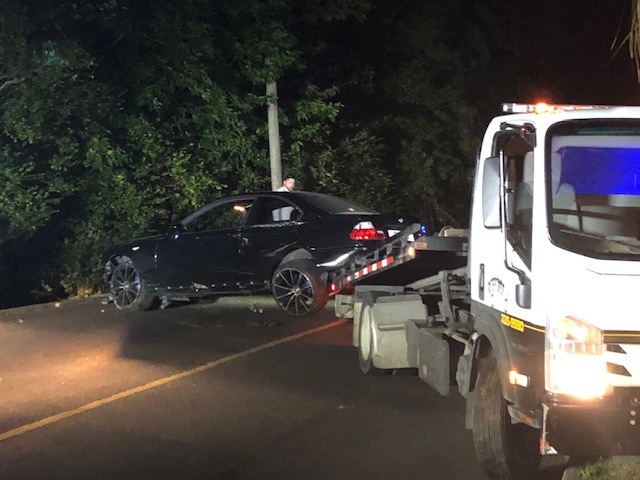 A police spokesperson said, “The appeal continues for witnesses to a single vehicle car crash that occurred around 7:45pm Saturday 19th January 2019 on South Road in Paget, near the Coral Beach Club, where the vehicle involved went off the road. “The occupants, said to be two 64-year-old men, were both arrested in connection with the incident and inquiries continue regarding the circumstances that led to the crash. “One of the men was also treated at the hospital for apparently minor injuries and later discharged. I thinking of an educational component should the person wish to return to driving. No way, he should be educated enough. Massive jail sentence plus fine and suspension along the lines of those he metered out in abysmal, heavy handed fashion. Trust they properly breathalysed. But he’ll walk. Especially for those in a position of authority, judging others while you do the same or worse, increased penalties would be very appropriate, and immediate dismissal. Am i the only one noticing the influx of seniors in crashes? I was almost struck by 2 in a matter of 5 minutes driving though town! They drive at a snails pace causing people to take chances and overtake. Stopped a senior going up Stowe hill (one way) the wrong way, and she told me that it was only one way on one side! I hope i reach that age too, but i also hope someone has the sense to take my license if im a danger to myself and others. IMHO there’s a lot of people in their later 80′s and early 90′s who are still driving who shouldn’t be . I don’t think that in this case a 63 yr old can be labeled as ‘senior’ but once you get to 75 (I believe) you have to be certified by your physician and take a renewal test every year. Maybe they should have their physician with them when they take the driving test just so they can see that having reasonable eyesight sometimes just isn’t enough . Otherwise ,we can easily flip this and say that there’s a load of people under 40 who shouldn’t be allowed anywhere near a vehicle either based on what goes on on the streets every day / all day . I’ve noticed as well. I’m sorry but there is an age limit (16) for when you can first get your license, and there NEEDS to be an age limit at the other end. Maybe 60 or 65. The elderly drivers are the most dangerous of all. As mentioned above, they cause many people to overtake where they ordinarily wouldn’t because they simply drive too slow. Regardless of the ridiculous speed limit, the majority of Bermuda drives between 50 – 60 kph comfortably. That’s a fact and we all know it. Some do go a bit too fast in the 65 – 80 kph range. But it’s those people driving 45 and under who are the real cause of most of our accidents. This is the most ridiculous comment on here, you are obviously living in a dream..People driving slow don’t cause nearly as many accidents as the impatient people that can’t imagine driving the speed limit..
Young (reckless) riders on cycles and drunk drivers are the most dangerous drivers, without question..
It’s going to be very interesting to watch how this plays out!!! Will surely be watching closely!! I agree. The public will be shocked when the truth comes out. You don’t know what the ‘truth’ is because you weren’t there..
Am shocked. Have seen some atrocious, heavy handed treatment of people for minor traffic offences handed down by this magistrate. Hope he is not given a free ride. I hope all procedures are carried out correctly and this person is held accountable. Could this just be a career ending crash?? Long overdue. These Magistrates seem to think they are above the law. If you go faster that is fine for you but if someone else to chooses to follow the LAW then YOU are in the wrong and you had better be more careful! I am fed up of idiots that speed to not a clue how to drive carefully. Overtake on corners, pass on the INSIDE. You think your time is more valuable than someone else’s life I hope you end up in prison! Drunk driving is part of the problem but just one small part of it. Speed it THE major problem. Bermudians are the worst drivers I have seen anywhere. No care for anyone on the road, no road sense. How many people killed in this week? THREE! At this rate we could see 150 people killed this year. Great. Lots of parking places! in correct many Bermudians are some of the most skilled drivers. example are bus drivers are truck drivers, tractor trailer and many more. what you are experiencing with the “No care for anyone” is globalization the capitalist mind set taking a hold on the island’s people. capitalist mind set is about me me and me time is money and i cant waste any time on any of you because it like throwing away money giving it to some stranger that is in competition with myself. this is why stopping at cross walks in important because it reminds people that we are in Bermuda STOP and relax let the people cross de road. I don’t know anywhere else in the world that has something like with with out a stop light. That is why our tourist are so amazed and stunned when they witness it. Don’t try and shift blame, do you realize that the more you drink the more you speed? Since we have no meaningful, factual itemized stats on this subject people are free to assume. 80% of locals drive under the influence at some point during the week/end. Wonder who the judge will be?? Bermuda is not what it used to be very rarely you can bum a ride even as a senor if gov had more money they could make taxi ride for them free. i have given a few of them rides before because buses can reach everywhere and many of are not very mobile even though many of them try lol step by step not moving no where no time soon. I know for sure i wont be in that time of sure when i get up there if i am i would rather pull the plug but i know it wont happen to me. Innocent until proven guilty , it shall of great benefit to all users of the road and all who lobby for safer roads and increased enforcement by those in blue if the wheels of Justice continue to turn at a fair speed. The driver of the car, who is it? Not friends and family? Ha! Don’t be so quick to “judge”…. also watching this space very closely!! It is illegal to drive whilst impaired. It is illegal to let someone who is impaired drive your vehicle. It is illegal to refuse to give a breathe test.